Yes, goldens CAN hunt! They do, however, have at least one unusual trait you need to be aware of when one's aboard your hunting boat. My retriever is a golden. Okay, stop laughing. Please. I know most of the breed leans towards the life of a lap-dog, but there are some strains (raised in Maine and Michigan, mostly) which have been maintained as serious hunters. And after owning a Chessie that was inclined to chewing the arms off of visitors, a friendly golden seemed like the right move. Why should you care? Because as it turns out, goldens have a unique hunting boat issue that evidently extends to some other long-hair retriever breeds. Yes, goldens CAN hunt! They do, however, have at least one unusual trait you need to be aware of when one’s aboard your hunting boat. Prior to a cold-water hunt, I purchased a neoprene vest for the dog, to help him retain body heat and get a bit of extra floatation. Good idea, right? As it turns out, no. After his first retrieves (a double – one hen and one drake mallard) he began shivering like never before. It got worse as the day wore on, and eventually, I cut the hunt short because I was worried about him. Back at home I called a friend who’s a trainer. As he explained it to me, while short-hair breeds benefit from these vests, some long-hair breeds have fur that’s evolved to trap air for insulation. Compress the fur, as a neoprene vest does, and you’re ruining the effect. In the long run, it’s actually making the dog much colder. Live and learn. After decades of waterfowling, I was making a huge mistake – one which had serious repercussions on my best hunting buddy. No matter how long you’ve been hunting and how long you’ve been a dog owner, it’s always good to pick up more tips, tricks, and knowledge. 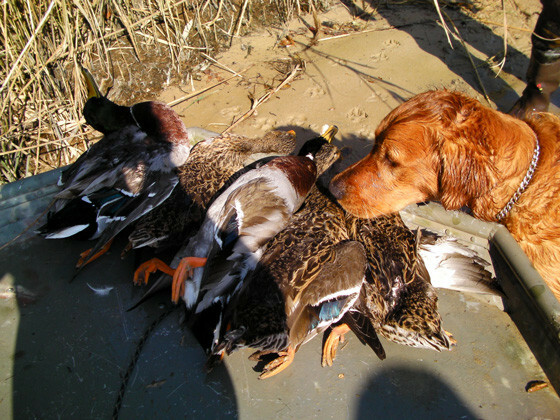 So here are three more important things to know about having a hunting dog on a boat. 1. If you’re hunting or boating in saltwater, bring extra freshwater for Fido. They tend to lap at the salty stuff, which dehydrates them. Keep an eye on your dog, and if he drinks from the bay, make sure you give him something extra to drink. 2. Unless your boat is large enough to keep the dog inside the gunwales with a leash, don’t leash it at all. The worst case scenario is when a leashed dog has enough lead to jump over the side, and is restrained or choked while in the water. It’s far better to have him make the leap unencumbered, and worry about getting him back in the boat without injury. (Then work on training him a bit more, obviously). 3. If your boat has fiberglass decks, lay out a piece of carpet. Dogs paws have a very tough time getting a grip on fiberglass, even non-skid (which you’ve probably noticed a time or two, if you have a fiberglass boat and you take your dog on it). The carpet will give his doggie feet a firm grip, and he’ll be much better off, especially in rough seas.